After reading Malin’s rave review of A Promise of Fire last year, I read the book but for some reason I didn’t review it. I have no idea why. Last year was a weird year. I enjoyed the book last year and even more when I reread it a few days ago. As I was writing my review of Breath of Fire, I realized I hadn’t written this review last year. The Kingmaker Chronicals are set in a land called Thalyria, which is broken into three kingdoms – Fisa, Tarva and Sinta. The people are either the magic wielding Magoi, or the non-magic Hoi Polloi. The Greek gods are worshiped, and are active characters. It’s a testament to how delightful Cat is that none of this annoys me. Cat is a “soothsayer” in a traveling circus. It’s very clear that she’s hiding some big secrets, and the reader figures out those secrets pretty quickly. That’s fine. There’s a tension in knowing Cat’s secrets when none of the other characters know. I do wish we had spent a little more time with the circus before Griffin comes into the picture. Griffin is a warrior, and the obvious leader of a small band of warriors. As it happened, he is the Hoi Polli Warlord who over threw the Magoi rulers of Singapore and now he is looking for magic users who will help solidify his family’s rule. So he kidnaps Cat and romantic tension ensues. Again, it’s a testament to the delighfulness of the characters that none of this annoys me. 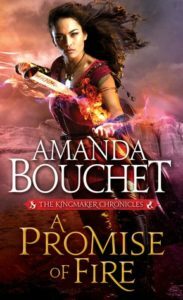 Bouchet writes good characters and dialogue. I hope that as she gains experience as a writer, her world building and plotting become as stellar as her character building. It’s a good read. The third book in the series doesn’t come out until January of 2018. You’ve got time. Share the post "I Didn’t Review This Last Year"